Itchy feet can be caused by a number of factors the most common of which are environmental. Exposure to constant moisture, such as sweat or wet shoes, or exposure to dry heat can cause itchy feet. Walking around barefoot exposes your feet to irritants and possible infection. All of these factors can cause bacteria, fungi, or parasites to grow and multiply on feet, causing itchy feet (1). Itchy feet can also be caused by health conditions, such as liver disease, cancer, kidney disease and thyroid gland diseases. Even pregnancy can increase the chance of developing itchy tootsies. Typically a doctor will prescribe a cream or other medication to help relieve itch caused by health conditions, but it doesn’t hurt to try some home remedies to relieve itchy feet as well (1). Skin conditions are another possible cause of itchy feet. Athlete’s foot is one of the most common, but different dermatology related conditions can also be a cause. Often these are also treated with special types of creams, and it’s probably a good idea to consult a doctor to make sure home remedies won’t make them worse (1). No matter what the cause of itchy feet, it’s an uncomfortable and annoying condition. Itchy feet can even become painful if the urge to scratch isn’t fulfilled or if blisters, rashes or sores appear. Therefore, we’ve researched the best ways to prevent, relieve and get rid of itchy feet. This sounds obvious, but you’d be surprised to find out how many people don’t try to keep their feet clean when they experience itchy feet. Keeping your feet clean means doing a number of things. Wear clean, dry socks at all times. If you get caught in the rain or are involved in a sport that causes your feet to sweat, dry your feet and put on new, clean socks as soon as possible. After taking a bath or shower, thoroughly dry your feet with a towel, and don’t forget between the toes (2). For individuals whose feet sweat a lot, invest in two pairs of shoes and switch using them every other day. This will help keep your feet dry. Bottom Line: Keeping feet clean and dry will help prevent itchy feet, as well as help it disappear faster. While walking around barefoot at home is ok, don’t walk around barefoot in public places. You never know what kind of bacteria is growing on the floors of public showers, gyms or on the street. Other people who are walking barefoot could be spreading bacteria and fungi that cause conditions such as athlete’s foot. Therefore, bring slippers or flip flops to wear around gyms, public swimming pools and public showers. This will help protect your feet from whatever might be on the floor (2). Bottom Line: Wear flip flops or slippers in public places to prevent itchy feet, to prevent spreading itchy feet, and to prevent itchy feet from getting worse. There are a few different ways to use cornstarch and baking soda as a way to prevent or relieve itchy feet. The first is put some cornstarch or baking soda on your toes before putting on your socks. Don’t drench your toes in it, just lightly dust or sprinkle them. This will help soak up moisture and sweat throughout the day. It won’t necessarily relieve itchy feet symptoms, but it should help prevent it from developing or getting worse (3). 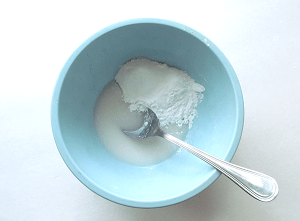 The second way is to make a baking soda paste. 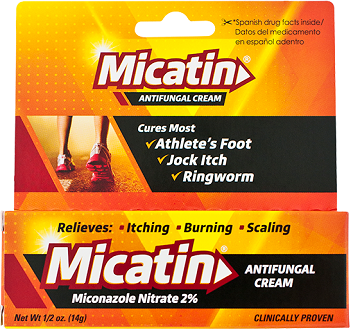 This should relieve itching and burning on your feet and in between your toes. Add a tablespoon of baking soda to two or three teaspoons of water, and stir until a paste-like substance forms. Then spread the paste onto your feet, making sure to get in between your toes as well. Keep the paste on for between five and 10 minutes, allowing it to dry. Then rinse your feet with cool water, and dry them with a towel. You can even sprinkle cornstarch on afterwards to soak up any remaining moisture (4). The third way is to heat cornstarch up and then put it on your feet. You can either heat it up in the oven or on the stovetop just enough to brown the cornstarch. Then apply it to your feet, and leave it on for 5 to 10 minutes. Afterwards brush it off with a towel (5). Bottom Line: Cornstarch and baking soda help soak up moisture, relieving itchy and burning feet. There are a few different concoctions you can soak your feet in to relieve itchy feet symptoms. The first is a saltwater soak, which can help relieve pain and itching. Add two teaspoons of salt to two cups of warm water in a shallow pan, (not the bathtub) and soak your feet for 5 to 10 minutes. Do this every hour until the itching goes away (4). The second way is soaking your feet in tea. Tea will dry out sweaty feet, which helps decrease itching sensations. Steep about five tea bags in about four and half cups of boiling water. Once the tea is ready, soak your feet for 30 minutes. However, make sure to let the water cool to room temperature before soaking your feet (2). The final concoction is a lemon juice mixture. 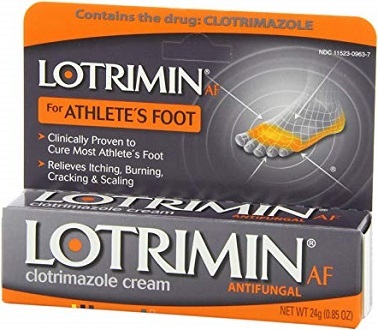 This mainly helps with odors that accompany conditions like athlete’s foot, but it might help relieve itchy foot symptoms. Just mix a half cup of lemon juice with 10 cups of water, and soak your feet for 10-15 minutes twice a day (5). Bottom Line: Soaking your feet in saltwater or tea can help get rid of itchy feet symptoms. Itchy feet can be a real bother, no matter what the source of itchy feet may be. It’s always a relief to be able to get rid of itchy, burning smelly feet as soon as possible. Hopefully, some of the tips on this list can help relieve your itchy feet.